Sammanthurai Sports Club beat Evertop Sports Club, Addalaichenai in the final to emerge champions and bagged the ‘BBB Mega Night Trophy-2019’ of the eight-a- side limited over cricket tournament conducted by BBB Sports Club, Akkaraipattu at the Akkaraipattu BBB Play Grounds recently. Akkaraipattu BBB Sports Club President M.H.Jiffry organized the tournament to mark the completion of nine years of the club. Addalaichenai Evertop Sports Club, won the toss and elected to bat first and scored 47 runs in their allocated 05 over’s for 4 wickets. In reply, Sammanthurai Sports Club, reached the victory target in 4.1 overs. Man of the match M.M. Sifras of the Sammanthurai SC and Best Bowler S.Rizad of Addalaichenai Evertop Sports Club were awarded prizes. Health, Nutrition and Indigenous Medicine State Minister Faizal Cassim participated as the chief guest at the award ceremony. 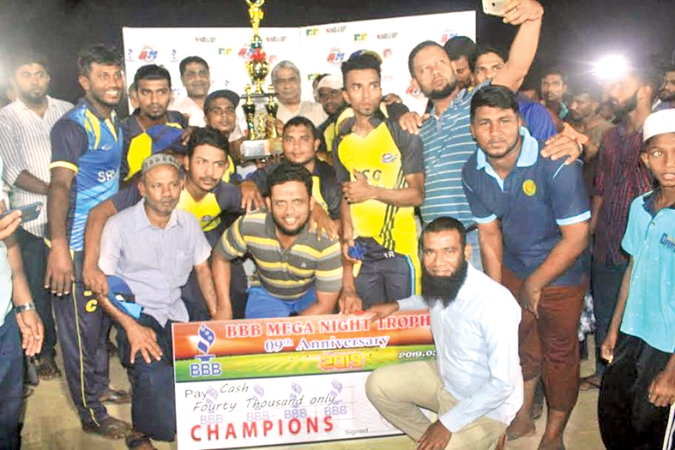 Winners were awarded Trophy and Rs.40,000.00 cash prize by the chief guest and the Addalaichenai Evertop Sports Club was awarded a cash prize of Rs.20,000.00 and trophy. Former Eastern Provincial Councillor and Akkaraipattu Football League President A.L. Thavam, club officials and many others graced the occasion.